‘This is cassava,” I shouted, trying to make myself heard over the music. “What? Who’s Cassandra?” We were sitting at a table at Carioca da Gema (Avenida Mem de Sá 79; barcariocadagema.com.br), drinking Brahma beer and eating thick pieces of aipim frita — fried cassava root. Rhychah (pronounced “hishah”) was performing with his samba ensemble. The venue’s flyer billed him as the “Pavarotti of samba” but he was more Barry White, guiding the musicians through the set with hand gestures, the rich vibrato of his voice soaring from one song into the next, never stopping. It was 10.45pm on a Monday night in the downtown district of Lapa, Rio de Janeiro, and the party was just getting started. Tom (Antonio Carlos) Jobim wrote the Samba do Avião to express his longing for — and joy at returning to — his city, Rio, its beaches without end and Christ the Redeemer standing with his arms open over Guanabara Bay. Five hours earlier we had driven through Tijuca — a national park with the remnants of the Atlantic rainforest that separates Rio’s north and south. I had curled my back over the railings at the top of Corcovado to try to take photographs of Cristo Redentor. Others lay on the ground, trying to do the same. Pilgrims, tourists … Christ’s face is beautiful, whatever you believed. 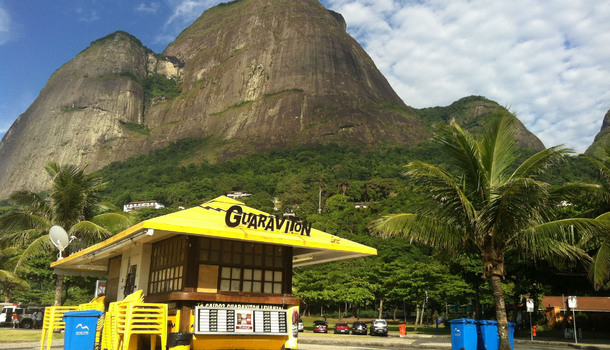 In Rio, the poor have found purchase on the heights. On another mountainside, not far away, motorbike taxis made their way up and down the incredibly steep streets of Rocinha, the largest favela in the city. According to the latest official census, nearly 70 000 people live there, although our guide, José Roberto Betao, said there were more than 240 000. Many of the city’s favelas are now monitored and patrolled by the blue-uniformed Unidade de Polícia Pacificadora or UPP (“ooh-peh-peh”), a peacekeeping force introduced to control drug trafficking and militias — to “pacify” the slums before the world descends on Rio in 2014 for the Fifa World Cup and in 2016 for the Olympics. “There is less … mafia,” Betao said, shrugging. He led us down a long, narrow passage, all the way to a faded pink door. Porta do Céu. The Gate of Heaven. Entrance: Two Brazilian reals (R$2 — about R8.20). It was locked with one of those cheap brass padlocks that would be easy to break open. Betao disappeared through another door and emerged a minute later with a key that unlocked the sky — a thousand rooftops spread out before us, dotted with satellite dishes and blue water tanks. From somewhere nearby, in one of the rooms, hidden, stacked on top of each other, a child broke out into song. A samba. From the top of Rocinha we could see all the way down to the beaches of Sáo Conrado, where you could buy cool, fresh Agua de Coco for $R4 from the yellow kiosks. The day before we had run with 6 000 Cariocas (Rio inhabitants) — 10km, from Sáo Conrado, past Leblon and Ipanema to Copacabana. It was part of the global Nike We Run series that was held in over 30 cities around the world, including a race in Johannesburg, which I had also ran. Encontre Sua Grandeza. Find your greatness. I even bought the T-shirt. But the race was hard, maybe the hardest I have run in the two years since I started running on roads instead of treadmills: it was hot — 26°C at 8am, even though the day was overcast and brought intermittent rain. There was a sneaky gradient and the humidity negated any benefits I had hoped to gain from running at a lower altitude. By the time we hit the halfway mark, I had stopped noticing the beautiful runners and the ocean, and started counting the space between traffic lights on the avenue. Walk. Run. Walk. The race organisers called it a “democratic” race — there were no big cash prizes for elite athletes, as there had been in Jo’burg. “In other countries, running can be a very individual activity. Here, it’s social,” the local Nike manager said. But by social he didn’t necessarily mean getting chatty with other runners on the road. Nike Corre (“run”) Brasil has more than 1.3-million “likes” on Facebook. It’s considered a very popular page. Runners of the Rio Corre 10K were given unique radio-frequency identification tags to attach to their left shoes, which triggered Facebook interactions along the route — photo opportunities, mobile video “confession” stalls to record a 10-second clip, and to post data to the runners’ timelines. Between autoposting to Facebook, most of the runners listened to their iPods. Nike Brasil has a project — a hashtag — Coisa da Boa (the good stuff) aimed at inspiring a new generation of runners, under-25s. At the end of the race, a group of them stripped off their race T-shirts and ran down to the ocean to cool off. They came back minutes later, dripping with seawater and confidence. Cariocas make everything look so damn easy. Eating: We celebrated our finish at Garota de Ipanema (Rua Vinicius de Moraes 49), the restaurant where Antonio Carlos Jobim and Vinicius de Moraes wrote The Girl from Ipanema. The grill remains something of an institution in the city. At busy times there are queues for tables, but it’s not a tourist trap: the prices are fair, for the area, and the food is delicious. Shopping: Two blocks from their beautiful beaches, the avenues of Ipanema and neighbouring Leblon are dotted with shops and restaurants. For a selection of hip rather than traditional new eateries, download the Wallpaper guide to Rio (available on iPhone and iPad). If the heat of the streets is too much, there is a handful of air-conditioned shopping malls in Leblon that offer upmarket local fashion and design. Inside Shopping Leblon (Avenida Afrânia de Melo Franco), you will also find a branch of Livraria da Travessa, the nicest local bookstore, and its shelves are laden with local literature and that warm, happy feeling that comes with many words on paper. There’s also a small but good selection of music in the store’s upstairs section. Boho Rio: The old neighbourhood of Santa Teresa is a glorious cobble of decaying mansions and new boutique hotels set on a hilltop. Skip the chi-chi craft shops and head into one of the many restaurants and bars for a light lunch and a draft beer (if you’re feeling flush, you can even sample local artisanal beer — at R$18 a glass). Nightlife: If you’re looking for live music, be sure to check out TimeOut’s local listings (timeout.com.br), which are up to date and in English. Otherwise head to Avenida Mem de Sá in downtown Lapa, where bars and clubs are clustered around the area near the old aqueduct. Events tend to start — and finish — late.